^ John E. Ferling, The First of Men: A Life of George Washington (2010) p.
^ Higginbotham, The War of American Independence (1971) p. 180. 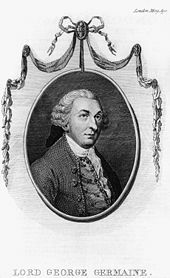 Martin, David G. The Philadelphia Campaign: June 1777–July 1778. Conshohocken, PA: Combined Books, 1993. ISBN 0-938289-19-5. 2003 Da Capo reprint, ISBN 0-306-81258-4. Anderson, Troyer Steele. 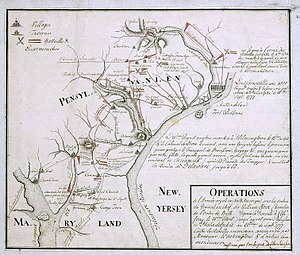 The Command of the Howe Brothers During the American Revolution. New York and London, 1936. 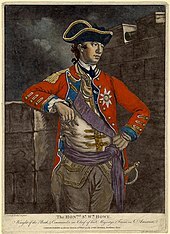 Jackson, John W. With the British Army in Philadelphia, 1777–1778. California: Presidio Press, 1979. ISBN 0-89141-057-0. McGuire, Thomas J. 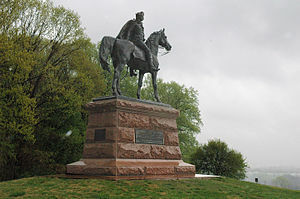 Battle of Paoli. Mechanicsburg, PA: Stackpole Books, 2000. McGuire, Thomas J. The Philadelphia Campaign, Vol. I: Brandywine and the Fall of Philadelphia. Mechanicsburg, PA: Stackpole Books, 2006. ISBN 978-0-8117-0178-5. McGuire, Thomas J., The Philadelphia Campaign, Vol. 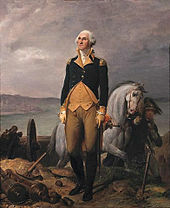 II: Germantown and the Roads to Valley Forge. Mechanicsburg, PA: Stackpole Books, 2007. ISBN 978-0-8117-0206-5. 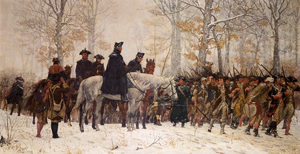 Taaffe, Stephen R. The Philadelphia Campaign, 1777–1778. Lawrence: University Press of Kansas, 2003. ISBN 0-7006-1267-X.